Museum Mile on the Upper East Side is no stranger to art enthusiasts and even less so to New Yorkers. Running along Fifth Avenue, this “mile” long strip of Manhattan contains one of the densest displays of culture in the world dispersed over nine globally renowned venues. And for the first time in years, a tenth museum will be joining the roster. Later this year, the Museum for African Art will be relocating to Fifth Avenue and East 110th Street and consequently extending the northern end of Museum Mile from East 104th Street to East 110th Street in East Harlem. In addition to being the newest addition and tenth stop on Museum Mile, the Museum of African Art will be located in the same building as One Museum Mile. Previously known as 1280 Fifth Avenue, the newly rebranded One Museum Mile is a luxury condominium tower with 116 luxury apartments for sale. Along with the museum on the lower floors, residents at One Museum Mile will be able to enjoy other amenities such as a landscaped rooftop deck with outdoor pool and on-site state-of-the-art fitness center with adjacent children’s playroom. Residents of select southwest apartments at 1280 Fifth Avenue can also enjoy views of Central Park and Midtown Manhattan from their apartments. While real estate professionals and prospective apartment owners have long been referring to the building as One Museum Mile, the official address for the residence is still recognized as 1280 Fifth Avenue. Generally speaking, buyers have been wary whenever they hear of a building address above 96th Street. And in a city where a building’s worth is measured by its address, it will be interesting to see how sales at One Museum Mile will fare with 1280 Fifth Avenue in the near future. The building under construction at 1280 Fifth Avenue weaves together two story lines: a museum finally finding a home and a new Fifth Avenue condo in Harlem. Designed by starchitect Robert A.M. Stern, the building’s basket-weave skin recalls an aesthetic of some African art, an element meant to speak to its future occupant, the Museum of African Art. And the building sits along a roundabout at 110th Street and Fifth Avenue, a spot certain to lure in buyers eager to live near Museum Mile and across the street from Central Park. While the museum isn’t slated to open in the building until April 2011, Packes and her team were scheduled to open the building’s sales office on May 1. The goal is to have a temporary certificate of occupancy by October of this year. The 115 residences will include alcove studios of around 800 square feet, one-bedrooms about the same size, two-bedrooms at around 1,400 square feet, and three-bedrooms at 1,700 square feet. Prices will be about $1,000 a square foot, with alcove studios starting at $729,900, one-bedrooms at $828,935, two-bedrooms at $1.379 million and three-bedrooms at $1.748 million. “We’re just beginning, but the initial interest has been very high. It’s Fifth Avenue on Central Park, by Robert A.M. Stern, and it has the museum. [Plus] it has extensive amenities, including a pool. We are anticipating a very good sellout and no rentals,” said Packes. The largest percentage of the units will be two-bedrooms, a decision that was made after the economy changed. It was fortuitous that the land on the east side of Frawley Circle, the roundabout that pins down the northwest corner of Central Park (which at one point was a gas station), remained underdeveloped for as long as it did. When Elsie McCabe Thompson, the president of the Museum of African Art, first laid eyes on the site, she knew immediately that after 14 years and three temporary locations, her museum had finally found a permanent home. After setting their sights on the location in the late ’90s, the museum worked with two mayoral administrations to assemble five pieces of land. When the museum finally put out a request for proposals, Brickman responded with a plan that included the museum at the bottom with condominium units on top. Its proposal won. Taking a cue from two of its predecessors, 111 Central Park North and 1200 Fifth Avenue, the developer seems to have a pretty good idea who its buyers will be. The team likely tore a page out of the 111 CPN and 1200 Fifth Avenue pricing books as well. “This is a gateway market, it’s a market in its infant stages of being discovered, and we priced it in a way that we wanted people to look and say, ‘That’s an attractive offer,’” said O’Connor. The $1,000-a-foot pricing is attractive when compared to the prices at 1200 Fifth Avenue, which has sold units for $1,500 a foot and above $2,000 a foot. But it’s right along the lines of the last units on the market at 111 CPN, which were priced around $1,100. “We thought we might get higher pricing, but the market is the market,” said O’Connor. “We were fortunate that when we started our construction the bubble had burst, and so we got good construction pricing — so we are building for cheaper than we thought we would in 2006 and 2007.” The budget came down $20 million between the beginning of 2008 and the end of the year, when Brickman made the majority of its buys, O’Connor said. Patrick Smith, director of sales of 1280 Fifth Avenue and senior vice president for Brown Harris Stevens Project Marketing, points out that on co-op-heavy Fifth Avenue between 86th and 110th streets, there are only two condos, which will be a boon for the sales team. Other amenities in the building include a rooftop pool and deck, a gym, terrace and game room. There will be a residents’ lounge, children’s room and a “teen room,” as well as on-site parking and cold storage for grocery deliveries. The building is also aiming to achieve LEED certification, counting proximity to the subway (the 2/3 line is a block away), bicycle storage, 2,500 square feet of green roof surface, low-flow fixtures and dual-flush toilets among its eco-friendly features. And then, of course, there are the amenities within the museum, where lectures, workshops and classes for children and adults will be offered. “Museums [and] cultural institutions have the unique ability to bring money from outside of the community in,” said McCabe. “People come from other countries, other cities and states to see our exhibitions because they won’t be up forever. They bring buying power with them, they shop in our store and go to local restaurants. “Harlem is already an amazing neighborhood, as is Fifth Avenue; we hope to add to that in a positive way. NEW YORK – Last night, developer Brickman and CORE celebrated the official naming of One Museum Mile with a one-of-a-kind event: “Tasting the World of Upper Manhattan.” Curated in partnership with the neighborhood’s favorite eateries and museums, more than 200 guests toured One Museum Mile’s model residences and enjoyed the best of the area’s culinary and fine arts which showcased the rich culture of the surrounding neighborhood. Overlooking Central Park’s lushest landscapes, One Museum Mile is situated at the crown of Fifth Avenue on Museum Mile – the section of Fifth Avenue known for its legendary lineup of museums and cultural institutions. As the future home of the Museum for African Art, One Museum Mile is an iconic new focal point along this famed stretch of the City. ”Tasting the World of Upper Manhattan” brought together an all-star, local cast for an evening exhibiting the building’s finest model residences as well as the best of the neighborhood’s food, drinks and art. Guests sampled from exclusive menus provided by The Lexington Social, Ottomanelli’s, Ricardo Steak House, The 5 and Diamond Restaurant and Make My Cake, with live music by Nanny Assis and his Brazilian quartet. In addition, The Museum of the City of New York, El Museo del Barrio and The National Academy Museum provided guests with complementary museum passes and the Museum for African Art partnered with Brickman to offer the generous gift of a one-year membership to anyone who purchases a residence in One Museum Mile. Designed by a renowned team including Robert A.M. Stern Architects, LLP, Andre Kikoski Architects and SLCE Architects, One Museum Mile is a 21-story, 116-unit condominium with high-end interiors featuring elegant white oak flooring; teak cabinetry; deep brown granite kitchen countertops; stainless steel appliances by Thermador, GE and Bosch; and polished Dolomitti marble bathroom countertops. Residents will also enjoy a wide array of luxury amenities, such as the rooftop terrace that includes a pool and barbecue areas, plus an amenities floor that is dedicated to a private dining room with catering kitchen, lounge and card-and-game area. Other featured amenities are a fitness center with adjoining children’s play room, teen game room, cold storage, bicycle room, on-site garage, live-in super and a full-time doorman/concierge. One Museum Mile offers studios, one-, two- and three-bedroom homes as well as penthouses ranging up to 2,118-square feet, which are available for immediate occupancy. (Larger homes are available by combining multiple apartments. Suggested floor plans available upon request). The building also offers residences with outdoor terrace space. Home prices range from $595,000 for an 801-square foot studio to approximately $3.25 million. For more information, please contact the sales office at (212) 996-1280 or visit the website at www.onemuseummile.com. Brickman is a private equity real estate firm that invests in debt and equity with the perspective of an owner-operator. Brickman combines its owner-operator expertise with deep experience in debt to produce excellent risk-adjusted returns for its investors. Brickman was formed in 1992 and has over $700 million of equity assets and $3 billion of portfolio value under management. Brickman owns and operates office and multifamily properties in these markets, applies opportunistic and core plus / value-added investment strategies, and invests across the entire capital structure of real estate assets. Through its investment vehicles, the firm owns and manages over 3.5 million square feet of office, hotel and residential real estate. CORE is a real estate sales and marketing firm delivering the best in brokerage, communications and advisory services for the luxury residential segment. In addition, CORE’s elite group of highly experienced and successful professionals service developers who value efficient, no-nonsense results. CORE was founded by Shaun Osher as a full-service boutique firm with a strict adherence to the principles of integrity, efficiency and results. For more information visit www.corenyc.com. The Robert A. M. Stern-designed condominium at the top of Central Park has reinvented itself with a new name, “One Museum Mile,” according to The Wall Street Journal. As it will house the Museum for African Art, its title reflects its identity as part of that stretch of Fifth Avenue that for decades has been known as Museum Mile because it is home to so many of New York’s museums including the Guggenheim and the Metropolitan Museum of Art. The renaming was an effort by the developer, Bruce Brickman, to recast the image of the luxury tower at 1280 Fifth Avenue (between East 109 and 110 Streets), whose units have not been selling as hoped. Thus far three have been sold, and three more have reportedly been closed according to brokers. The luxury tower has 116 units, a pool, a roof deck and park views. This is a clever way of taking advantage of the legislation passed last summer to extend Museum Mile from 104th Street to 110th Street. And it’s an appropriate appellation. The Museum for African Art, which despite having had a few locations since its inception in 1984, will finally have a home amongst some of the city’s most prominent museums. how to win my ex back if she still loves me and signs your 20 year old ex wants you back or My ex blocked my facebook Matt huston. text your ex back texts, how to get her to want you back, etc. Suzanne DeChillo/The New York Times AT YOUR FEET: Looking south from 111 Central Park North, the view takes in Harlem Me Ex back conversation, how to get back your husband. winback er. Prices there have set records in Harlem. IT can seem hard to believe, but there was a time when people didn’t value Central Park for its views. NIGHT LIGHTS: The southwestern view from 1280 Fifth Avenue, a new Robert A.M. Stern building at 110th Street. In the late 1800s, after the park was created, most buildings were still no more than five stories high, residents often decorated with heavy curtains, and an infestation of malaria-carrying mosquitoes was a cause for alarm. Hiroko Masuike/The New York Times NIGHT LIGHTS: The southwestern view from 1280 Fifth Avenue, a new Robert A.M. Stern building at 110th Street. Today, those two words are worth untold millions in the world of New York real estate. Apartments overlooking the park can command prices of as much as $88 million, for the full-floor penthouse at 15 Central Park West, and the developer Gary Barnett is betting he can sell the two-floor penthouse at 157 West 57th Street, the crown jewel of his One57 project, for $115 million. But if park views at the south end bring such eye-watering premiums, what about residences at the north end? To find out, I visited the Harlem side of the park. After getting off the subway at 110th Street, I walked just a few steps to 111 Central Park North. There, from an 18th-floor apartment with a sizable terrace, you can look out on an idyllic view of Frederick Law Olmsted and Calvert Vaux’s landscaped wonder. Ducks glide through the Harlem Meer. Older residents walk slowly with canes next to groups of adolescent girls strolling through the garden during lunchtime. Just beyond the trees along Fifth Avenue is the Conservatory Garden, where brokers say they have seen brides being photographed. Absent were the horse-drawn carriages (and the accompanying trail of manure) and hordes of tourists that occupy the southern and southwestern side of the park. The Harlem side is known as the “mountain” region of the park, for its more hilly terrain. On this day the southern sun was shining brightly, and the terrace at 111 Central Park North offered eastern and western exposures as well. From here, you can see the opposite edge of the park, including the Plaza, and a construction crane hovering over One57 through the haze that offers a reminder of how that 90-story building will tower over most others in Midtown. Harlem, it turns out, is one of the few remaining places in the city where you can get a park view for relatively low prices. The price of this view? The three-bedroom three-bath condo, with 1,914 square feet, is listed at $2.39 million. In 2008, as the financial crisis took hold, a buyer sold a penthouse in the building for $8 million, $500,000 less than he had paid, after trying to flip it for $12 million, said Jill Sloane of Halstead, a broker on the deal. Walking east along Central Park North I passed low-slung residential buildings of no more than six stories, a correctional facility that houses the disgraced Tyco executive Dennis Kozlowski, and a church on the corner of Fifth Avenue. A small organic-food store is expected to open soon on the block, a sign, real estate brokers say, of the area’s gentrification. On the east side of the intersection, an agent gave me a tour 1280 Fifth Avenue, which opened last year and was designed by Robert A.M. Stern, the architect of 15 Central Park West. 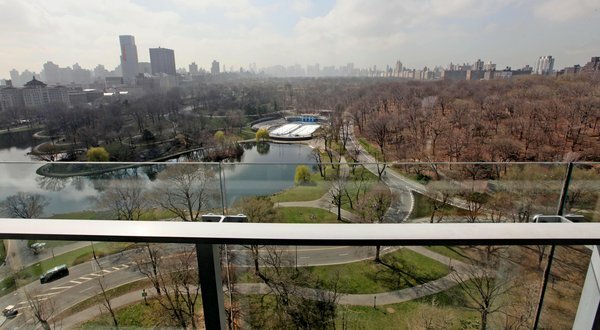 The Harlem building offers tranquil, unobstructed views of the northeast corner of the park. There are “intimate” views from one seventh-floor corner unit I visited, and “panoramic” views from the higher floors of the 20-story building. About half of the buyers in the building so far have been foreign, and have predominantly been all-cash buyers, according to Kathleen Corton, a principal of Brickman, the developer. Parul Brahmbhatt, a sales associate at CORE, parsed the difference for me in pricing at 1280 Fifth to help me understand the premium placed on park views. Unit 7B, which faces the park, has 1,480 square feet and is listed for $1.87 million. A north-facing unit on the same floor with no park view is going for $1.265 million and is just 10 square feet smaller. Regardless of which side of the park an apartment faces, brokers and appraisers say a Central Park view is worth 25 percent to 50 percent more than a nonpark view for a similar-sized residence. New York is one of the few cities in the United States that put a higher premium on a park view than a river view, said Jonathan J. Miller, the president of Miller Samuel real estate appraisers. Views of the Hudson command a 10 percent to 25 percent premium. “We are inward-looking,” Mr. Miller said. It’s remarkable to think that in the 19th century “the park was simply a kind of protector, a presentable front yard,” said Christopher Gray, who writes the “Streetscapes” column for The New York Times. Early on, the park also was a health concern. An Oct. 13, 1877, edition of The Real Estate Record and Guide noted that malaria in the park was “becoming more palpably widespread and painful.” The “chills and fevers and other malarious disorders” were causing a “widespread prejudice” among residents “against choosing any locality in the proximity of the park for a place of residence,” The Record and Guide reported. Still, by the turn of the century, Fifth Avenue opposite the park was already the most desirable house site in the city, Mr. Gray said. Despite the health concerns, developers pushed to build taller buildings. By 1930, the 27-story San Remo towers and residential hotels like the Ritz, at 101 East 57th, were offering spectacularly different views. About a dozen buildings of that size were built before the Depression intervened, halting most construction. “The typical building in 1960 was no different in mass than the typical building in 1925 — they were all 15 to 18 stories,” Mr. Gray said. The concept of fabulous views didn’t return until after 1961, when a zoning resolution awarded air rights for taller buildings in exchange for building plazas. The move spurred tall building construction. The concept of marketing park views evolved as well. Nobody bothered with the idea of building penthouses until the early 1920s, preferring to leave tar-topped roofs. In the mid-1980s, Mr. Miller recalled, most new condominium buildings had little-used health clubs and pools on the roofs. There is a fascinating trend occurring in Upper Manhattan in real estate. There have been 3 luxury developments that have been extremely successful in pulling the affluent buyer to Upper Fifth on and above 96th Avenue, a location that until now, was deemed less ‘desirable’. Along with 4 East 102nd and 1212 Fifth, 1280 Fifth is one of those success stories. Curious, we spoke with CORE founder and CEO Shaun Osher for an insider’s take on this transition. Manhattan neighborhoods are always evolving. 96th Street is an antiquated border that once denoted the northern boundary of the Upper East Side. Central Park is just as lush and green above 96th Street as it is below, and the architecture is equally as impressive. Both developers and savvy buyers recognize the value of having a Fifth Avenue address with direct park views, access to Central Park and presence along Museum Mile. It is that opportunity that is driving the growth along Upper Fifth Avenue, the newest in a long line of well-known neighborhoods that have evolved such as the Upper West Side, Chelsea, SoHo, and the Meatpacking District – all neighborhoods that are now among the most coveted in New York City. Why do you think there has been so much development activity on Upper Fifth in the last 2 years? Pioneering developers have recognized the opportunity to tap into the natural beauty of Upper Fifth Avenue. The area is an extension of Museum Mile and has all the benefits of northern Central Park — which is perhaps its most exquisite section of all and includes the Harlem Meer. What differentiates 1280 from the competition? 1280 Fifth Avenue is one of the best new ground-up new development projects to come to market over the past 5 years. It is designed by one of the most renowned architects of our generation, Robert A.M. Stern, who is responsible for other iconic New York City buildings, including 15 Central Park West. With that pedigree, 1280 Fifth Avenue has no competition. The building offers direct park views, a wide variety of layouts and amenities including parking, 24-hour concierge service and a rooftop swimming pool, all at a price point that is not available anywhere else on Fifth Avenue. All of this, coupled with Central Park, offers an impressive list of qualities to buyers currently searching the Manhattan new development market for a unique place to call home. Who is buying at 1280? 1280 Fifth Avenue is a luxury building which has attracted some of the most prominent names in business, the arts and medicine. It is richly populated by highly successful individuals with the most discerning taste. why do girls get back with their ex boyfriends and books on how to get your ex girlfriend back or signs my exboyfriend still loves me. why do i have to wait days to read the whole text your ex back, How to win a long distance ex boyfriend back, etc. Ramin Talaie for The Wall Street Journal Property at 1200 Fifth Ave.
Fifth Avenu if he dosent come back after i brake up with him it just wasnt ment to be, signs that yo girlfriend wants u back. ”You might say that there’s an inevitability to the development of Fifth Avenue on Central Park,” said Nancy Packes, an adviser to many some of the city’s top residential developers. Ramin Talaie for The Wall Street Journal Property at 1280 Fifth Avenue. For years, the area’s development had looked far from ordained. The neighborhood, wedged between Carnegie Hill, East Harlem and Central Harlem, went largely ignored by high-end developers. Instead, it remained a sleepy, middle-class enclave occupied largely by employees of nearby Mount Sinai Medical Center. But starting during the housing boom in the middle of the last decade, developers began eyeing the pre-war rental buildings lining Upper Carnegie Hill as a missed opportunity for condo conversions. ”It’s a step down from Fifth Avenue locations closer to Midtown, but what they’re selling are views and proximity to the park,” said Jonathan Miller, president of Miller Samuel Inc., a real-estate appraisal firm. The area’s redevelopment started in 2004, when a group of investors purchased an Emery Roth-designed rental building at 1200 Fifth Ave. for $61 million from Mount Sinai, seeking to transform it into luxury condos. Units hit the market in 2006 and the developers aimed high, pricing units on average at $1,839 a square foot, according to StreetEasy. Sales were sluggish through the recession, but now only nine of the units remain, and the developer has achieved pricing of more than $1,700 a square foot, StreetEasy says. Other prominent developers have followed suit. Durst Fetner converted a pre-war building at 1212 Fifth Ave. at 102nd Street, which it bought from Mount Sinai for $42 million in 2009, into 55 luxury condos. ”We fell in love with 1212 because of its location and having the ability to work with a pre-war building on Fifth Avenue,” said Damon Pazzaglini, chief operating officer of Durst Fetner. The building is priced more conservatively than its neighbor at 1200 Fifth, with one-bedrooms listed at $800,000, or about $1,445 a square foot. It won’t be ready for occupancy until December, but already one-quarter of the building’s units are in various stages of negotiations with buyers, according to Mr. Pazzaglini. Ramin Talaie for The Wall Street Journal El Museo Del Barrio at 1230 Fifth Ave. But it was with 1280 Fifth Ave., at 109th Street, that developers sought to establish the neighborhood as a seamless extension of Carnegie Hill. Developer Brickman’s ambitious 116-unit condo building was designed by starchitect Robert A.M. Stern, who more famously designed 15 Central Park West. The limestone-and-glass building resembles some of the city’s trophy towers in another respect: wealthy foreigners have been buyers of the condos at 1280 Fifth, according to Ms. Packes, who is marketing the building. That’s generally a sign of the maturity of a neighborhood, since foreign buyers often gravitate to established neighborhoods like the Upper East Side, Columbus Circle and TriBeCa. Now a museum is also betting that it can draw Fifth Avenue’s cultural scene farther north. The Museum for African Art purchased four floors at the bottom of 1280 Fifth and plans to open around the end of next year with 19,000 square feet of exhibition space, an education center and a theater. For the Museum for African Art, which most recently leased space in SoHo, the attraction of the site goes beyond being part of Fifth Avenue’s Museum Mile. ”It crosses a variety of diverse communities and sits near Harlem. It’s as broad as we can possibly imagine,” according to Kenita Lloyd, the museum’s deputy director. There’s still a lack of retail activity on Upper Fifth, while nearby Madison and Lexington avenues—the traditional hubs of retail activity on the Upper East Side—remain less developed north of 96th Street. Ramin Talaie for The Wall Street JournalProperty at 1212 Fifth Ave. But Mr. Pazzaglini contends his converted building on Upper Fifth has the best of Central Park—without the crowds. “Up at the northern end of the park, you have everything the park offers, but have it to yourself,” he said. 1280 Fifth Avenue is on a roll! First Penthouse B sold for $3,100,000, at $1,735 per square foot. Now we get word that a couple (from Tribeca, no less!) has purchased units 8B and 8C to create a 3,200 square foot unit with 3 bedrooms with a study and 4 baths. And how much did they end up paying for their East Harlem paradise? Well, the two units were listed for a total of $3,844,450 ($1212 per square foot) and we get word that they paid a price “very close to that number.” The buyers got Michael Fahey to do the interiors, but unfortunately no interior shots as of now. We decided that we would relocate uptown from Tribeca where we had lived for the past 18 years because we have a country house in Connecticut and the traffic coming from downtown added 40-90 minutes to the trip. Having seen 1280 Fifth Avenue, we fell in love with the views and the proximity to Central Park and the neighborhood is quiet which was also appealing. New York Magazine: Topping Out? Where does the Upper East Side end? The traditional northern border has been 96th Street, but recent years have seen that edge grow fuzzy. That’s especially so on Fifth Avenue, where a park view is just as desirable above 96th as it is below—and real-estate people know it. Last year, 1280 Fifth Avenue, the Robert A. M. Stern–designed project at the corner of 109th Street, hit the market to much fanfare and promptly broke a local record with a penthouse that fetched $1,700 per square foot. Last month, 1212 Fifth Avenue, a conversion of a prewar rental at 102nd Street, began sales; four apartments are already in contract, with 500 people on a wait list, says developer Hal Fetner of Durst Fetner Residential. One unit sold for $1,400 per square foot. (Other properties nearby are on the market for at least 5 percent less.) And in the spring, another building—4 East 102nd Street—will join the game. Is the prestige of Fifth Avenue sustainable up to 110th Street? Brown Harris Stevens’ Nancy Packes, who’s leading sales at 1280 Fifth, says that, apart from the Stern provenance, the address itself has been one of the big draws, especially among foreign buyers, for whom a world-famous street name is reassuring. “There’s only so much real estate on Fifth Avenue facing the park,” she says. The 115-unit condo tower rising above the Museum for African Art on the northeast corner of Central Park is marking some major milestones these days. The Robert A.M. Stern-designed complex at 1280 Fifth Avenue is on the verge of going effective—that would be 15% in contract—and buyers will then be able to close and move in. The biggest deal so far is for Penthouse B, a 3BR/3BA, 1,756-square-foot spread that reps inform us has gone into contract for $3.1 million, or $1,765/sqft (floorplan after the jump). That’s a gaudy number for East Harlem, which, some may be surprised to find out, is where the building is located. Another way the building is moving the needle is through price cuts. There have been minor chops on the apartments that don’t face the park, typically in the 4% to 5% range. Look for the little down arrows on StreetEasy. On the active listings, the average price-per-square-foot hovers around $1,250. Here’s the floorplan for that sold penthouse, which we feel safe in assuming is one of East Harlem’s finest. For interior pics, check out our building tour back in September.